Anyway, I'd wanted to get this going for train control for a while after managing to make a Wii Nunchuck control my trains. You can find more information on the controller at SEGA Retro, SEGAGAGA Domain, Wikipedia, Play Asia and genki Video Games. Quite a few months ago I spent a few hours with my Densha-De-Go controller and my Arduino Mega in an attempt to get them to communicate. The goal was to be able to read the controller and then use it to control my model railroad. Unfortunately, I was doing this blind, running off information from Marcus Comstedt's 'Dreamcast Programming' site; specifically his breakdown of the Maple Bus Protocol. I ended up with nothing working and sent out a few pleas for help on the Arduino forum and to Marcus himself. I received information regarding the fact that it should work (the Arduino had the horsepower), but I would have to ensure the timing was intricate and that the Arduino was always ready to receive data. I then posted to the Arduino Forum for help. A few months later WzDD came to my rescue with word that he had successfully made the Arduino communicate with a Dreamcast Controller. I hadn't had much time up until now to work on this, and WzDD hadn't done any further work on it, so I took it that he just wanted to prove the concept and that I'd have to get off my backside to make things progress further. In the end, I did want to get my controller functioning. I had previously had everything I needed to test this again, so I gave it another go. My previous setup was a cut-in-half Dreamcast controller extension cable and my Densha-De-Go controller. The extension cable meant I didn't have to hack around with the actual controller or port imitation. Due to the requirement to use assembler for the actual low-level controller interactions, we cannot use the Arduino IDE and must use WinAVR (or just avrdude on Linux.) Download this from here (select the latest version) and install to the default directory. You then need to download the arduino-maple source code and extract somewhere locally. I've put the folder on C:\arduino-maple\. c:/winavr-20100110/lib/gcc/../../avr/include/avr/delay.h:36:2: warning: #warning "This file has been moved to <util/delay.h>." Now, as you can see above... that's not my Arduino! I have an Arduino Mega and therefore we need to adjust the Makefile correctly for my setup. Here you'll need to know the CPU code, interface type and the port number. Also make sure you change the upload task to program so that we can use the menu items in WinAVR. #	$(AR) rcs $(TARGET).a $? # Programming support using avrdude. Settings and variables. avrdude: reading input file "app.hex"
And that's it, our the compiled code for the arduino-maple project is now on the Arduino and running! Note that I downloaded and installed Python Version 2.6.6 as this was the version that would have been available when arduino-maple was created. After selecting 'IDLE' from the start menu, I was presented with a light-weight GUI. I opened up the 'maple.py' that's included with the arduino-maple code and attempted to compile it. I had problems at the start, as in the included Makefile there are two declarations of CPU type. Initially I hadn't set these both correctly and the Arduino includes were not correctly compiled... make sure you carry out a proper clean whenever changing code; this includes manually deleting all of the .o files. Once this was sorted, it all finally worked... sort of? Name       : ..TAITO 001 Controller      $. Play with the controller. Hit ctrl-c when done. As I continued to run the code, I would get random results as to the 'Name', 'License' and 'Power' fields... well, it was obvious in the text fields that there were problems, but I had no idea that what the 'Power' fields were meant to read. Either way, this indicated a timing issue somewhere and I guessed that life was about to get difficult. Note that I had always been running the controller at 5v, as that's what WzDD's post said the blue wire should be connected to, but it turns out that the device should have actually been running on 3.3v. Unfortunately, setting the controller on to 3.3v didn't change anything... the responses were still mildly random. The buttons would be sent though correctly (apart from the B button) but the initial device description would come through jumbled. I took a few samples of the data and realised that the data would always have a minimal length. To me this meant that we weren't missing bytes/bits, but actually reading too many. The analysis showed that there were similar chunks all the way through, but at certain intervals there'd be extra/changed characters. Based on Marcus Comstedt's Maple Bus information, I guessed that we were re-reading bits too quickly and needed to slow down a little... This would mean slowing down the pin reading in WzDD's arduino-maple assembler code. In the maple_rx_raw: function down near _rx_loop:, the code iterates through the pins hoping to read the data. It initially checks the state of the pins to sense when the controller is about to send data, but this did not have the final check for the second pin going low. The above code was added around line 305 to ensure this check was in. I then also 'spaced' out the store/read calls by placing a delay in. WzDD had already written the delayquarter macro and I simply re-used this. After these two changes, the text from the device information call worked flawlessly. But my B button still didn't work. I decided the B button wasn't important at this stage and went on to decoding the controller to work out how the levers functioned. So, after having used the standard Dreamcast controller to play hours-upon-hours of Shenmue, Shenmue II and Chu chu rocket, I would have expected at least one of the levers on the Densha-De-Go controller to use the analog joystick and the other to also use some form of analog control. After a few minutes decoding the controls, it became apparent that they simply used the buttons available (up, down, left, right, x, y, z) in a binary-value style configuration. In between the B's there is a slight overlap of the buttons, where the current and next 'combination' is combined, but this doesn't seem to last more than one cycle. In between the EM's the controller reads UP-DOWN-LEFT-RIGHT. This area exists between all EM's and B8-EM0 and seems to be about 3mm wide. Now it was time to get this incorporated into my original train throttle. I didn't want to have to use the Python code, so instead I 'crafted' the packets into the Arduino code. //here is a quick packet to request device information from controller 'one'. //i.e. the only controller connected. //send the above packet to initiate comms with the controller. I'm going to gloss over this part pretty quickly, as this post was more about getting the Dreamcast controller usable rather than another lesson in physics and model railway throttles. 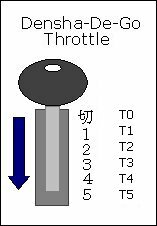 For the code, I ended up just deciphering the packet that comes back from the controller, working out what the throttle position is and then adjusting the target speed. The main program loop then makes then increment/decrements the current speed to eventually match the target speed. This provides a very simple form of acceleration. The changing of pin 13 below lights the on-board Arduino LED to show once the loop has made the speed match the target speed. Note that this does not include the Python code; nor will my code correctly interact with the python code anymore. The goal was always to have the Arduino talk to the Dreamcast controller directly. As you can see, I've only implemented the throttle on the controller... I need to now bring in the brake lever as well, but this is where the physics lesson comes in. I'll be posting again soon enough with source code for acceleration and braking using this controller. I've got a few ideas as to how to semi-realistically control the train with both levers, but I will need to do a little more reading before I get something going. 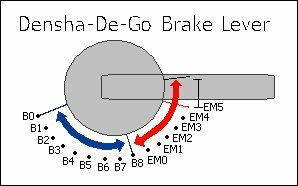 I do know that in the actual Densha-De-Go game, the game complains when you have both levers on at the same time... and it seems wrong to be doing so... but then again, it'd be like doing a hill-start :) Maybe for freight trains? If only our model railway trains had gears and could free roll! Steve, this is really excellent work! Very exciting. I’ve done a little reading on simulating train physics, and have good links I can share with you later on. Don, this will come in handy… My only concern is that with boring DC voltage (and very lame PWM) I’ll not be able to adjust the speed to the resolution I really want to. I also need to work out the timing of the main loop in this version of the code, as the calls the to the Dreamcast are intensive and limit the ability to do other processing in each loop. Of course, I don’t need to poll the Dreamcast each loop, so there is one way to save cycles already. Congratulations on getting it all working — I’m impressed that you managed to get another (very cool looking) controller going, given that the code is somewhat, uh, rough. Sounds like there’s a lot of opportunity to mess around with getting the physics simulation right… could you do different curves for acceleration / braking for different types of train? The controller was, honestly, such a waste for poor old Sega. It’s only good for one game, and that game was made too late; as the whole Dreamcast was pulled not long after its creation. But, nonetheless, it works great here. As for the physics… I could definitely do different models per train/locomotive. In fact, it has to be done as each locomotive behaves differently depending on input voltages. Motor sizes and conductivity to the rails mean that one loco at a certain voltage could speed along whereas another hardly moves. It’s all going to get a little tricky… I might try and have an ‘upload’ ability for the train movement models so that don’t have to reprogram each time. And, of course, I can’t thank you enough for getting the initial communications between the controller and the Arduino going! I’m working on a somewhat similar project; also attempting to use WzDD’s code to communicate with a Dreamcast controller and also using an Arduino Mega (this time with the purpose of flashing custom VMU images). I’ve been able to successfully(?) flash the program to my Arduino using avrdude under Ubuntu, but maple.py seems to consistently time out after 10 echoes of “are you there?”. I feel like I’m so close I can taste it.. If you still happen to have your modified project files lying about I would really appreciate them! It’s been forever since I looked at this, so bear with me. Just to confirm, you’ve taken the code from: https://bitbucket.org/nfd/arduino-maple/src and that’s what’s reporting the “are you there?” message? I’ll download this when I get the chance and try and work out what it’s doing when it’s outputting that line. I would like to get one rip the guts out and hack it to a Ps2 keyboard circuit and driver. about 3 months to finally finish the project.